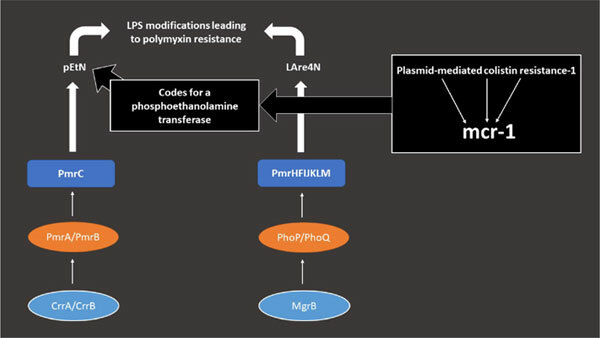 The global spread of carbapenemase-encoding genes among Gram-negative nosocomial pathogens has led to the revival of polymyxins. Colistin and polymyxin B, despite their serious adverse effects, have become last resort treatment options for multi- or even extensively-drug-resistant bacterial infections due to Klebsiella pneumoniae, Acinetobacter baumannii and Pseudomonas aeruginosa. Their use, however, has been followed by an increase in polymyxin resistance rates and the spread of transferable resistance genes limiting further the treatment options and contributing to the emergence of pan-drug-resistance. In the present review, the to-date known polymyxin resistance mechanisms, as well as patents related to polymyxin resistance, are discussed. Polymyxin, colistin, mcr-1, mgrB, resistance, carbapenemase-encoding genes.